Continued from here: Why Texas is great! 34. The stunning art museums in Houston, Dallas and Fort Worth. And the fact that we know enough not to act shocked at the idea that Fort Worth would have a world-class art museum. Really!!! If you live in DFW and have never been to a museum, shame on you!! They have all kinds of cool special events PLUS their normal day to day exhibits... beat the Texas heat in the summer and go to the museums! 33. Did you know that the odds of meeting an actual astronaut are higher in Texas than anywhere else? Seriously! No wonder Mads wants to move there! 31. Texas Sunrises over the Gulf.....even if you had a rough night, they can brighten your spirits and they are truly unlike sunrises in any other place on earth! 30. No matter what teams you cheer for or what sports you love the best, we can all be proud of the likes of sportsmen like Nolan Ryan, Tom Landry, Lance Armstrong, Lee Trevino, and Earl Campbell. 28. I LOVE that there is BBQ and then there is TEXAS BBQ...and believe me, they are NOT the same. We may have a state covered with the ugliest and seemingly useless tree on the planet (MESQUITE)...but boy do we know how to make the best of what God has given us. You haven't really had BBQ until you've eaten meat that has been smoked/roasted/grilled with mesquite wood! 27. Denmark may have "pølsehorn" but in Texas we have Kolaches (thank you Czech Republic!!) AKA "pigs in a blanket" and I am sorry DK... if I had tried yours first, I might think more highly of them, but there is nothing like stopping at a bakery on the way to school to pick up a few kolaches still warm from the oven! 26. I LOVE LOVE LOVE that no matter where you are, you can start singing; "The stars at night are big and bright" and someone in the crowd will either 1) sing the next line with you or 2) do the clapping part and then sing the next line with you! Even Sheldon Cooper (one of my current heroes) knows the power of it! 25. Friday Night Lights. Not the book, movie or show -- the real thing. High school football in small-town Texas is something everyone should experience at least once. Trust me. There is NOTHING quite like it on earth. And for that, we are actually quite proud! 24. Texas A&M Aggie Football. Whether your blood runs maroon, burnt orange of none of the above, EVERY Texan should experience an Aggie football game at least once. I used to think being an Aggie was like being a Moonie or a David Karesh follower; however, I admit, that there is something really cool and really special about being at Kyle Field with 90,000 people and watching the POWER that the FIVE Aggie Yell Leaders have to get the entire crowd chanting the same cheers... yeah, a LITTLE cult-like, but really really powerful! 23. Did we mention our State used to be a nation? Yeah, our state used to be a nation. And that our flag is the only flag of the 50 states that can fly at the same height at the US flag? I do love the great State of Texas and there is no place on earth quite like it. I'm glad you are happy in Denmark but I hope you never forget where your roots are - it is a special place. Are you homesick Kelli? I dearly love San Francisco and our sweet redwoods and our lofty Sierras but I have no huge feelings about California as a State because we need to always tolerate the idiots in SoCal. I appreciate all the nice things you have said about Texas though because I always thought it was a place people carried guns as some kind of a weird civil right. I would vote in an instant to ban all guns in the USA. You are extending my NorCaleducation. Oh, how I miss Mesquite BBQ! I can smell it just thinking about it! My DAD left a comment. First of all- so cool your dad commented! Wish my dad did stuff like that! Maybe I´ll have to borrow your dad a bit to give my dad the hint? Suppose that is ok? Second- are you homesick? Just curious with the Texas list...just reading it makes me homesick. Reading it also makes me realize that I am not as grounded in Texas as you are. Texas will forever be in my heart- no doubt..but I didn´t spend as many years there as you and by no means do I have the same knowledge about that great state as you do...BUT...I have spent summer nights on the porch chowing down on blue bell ice cream...I adore George Strait, I agree, the BBQ in Texas is out of this world- the beef in Texas is fabulous...I love the diversity of the state ecologically...and yeah, I was a lot more into sports when I was in Texas then I am here in Norway. Something about Friday night high school football games...ahhh....good times! Sounds so nice and VAST! Appears like you want to go back there at some point. I can't say I wouldn't like to end up somewhere like that, too. To have all that space after being in Denmark would be amazing. Amen to all of the above! (I'll even give you the A&M football game, but that's a real stretch for me :) Didn't know that about our flag, either. 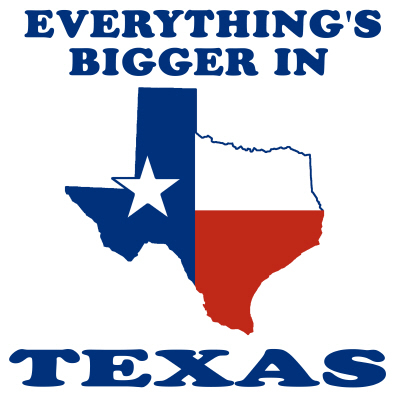 My Dane told a friend at dinner last night that of all the places he's been and lived in the US (43 states and 4 states respectively), Texans are the nicest people. And I promise I never paid him off or brainwashed him or anything!